See at full resolution to read the bubbles, and sorry for not deflating it at all. …1: The Unabombers legal defense team cited the size of his shack – 10′ x 12′ – to buttress his insanity plea. …2: systems can drain a 40 gallon tank in less then 4 minutes. 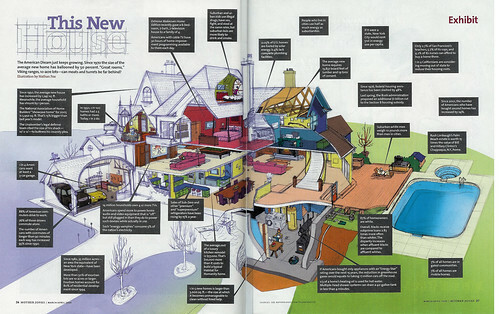 Illustrated by Nathan Fox in Mother Jones, March + April, 2005, Volume 30, Number 2, pages 26 and 27.